We at Geeky Hobbies would like to thank Two Tribes for the review copy of Rive used for this review. Other than receiving a free copy of the game to review, we at Geeky Hobbies received no other compensation for this review. 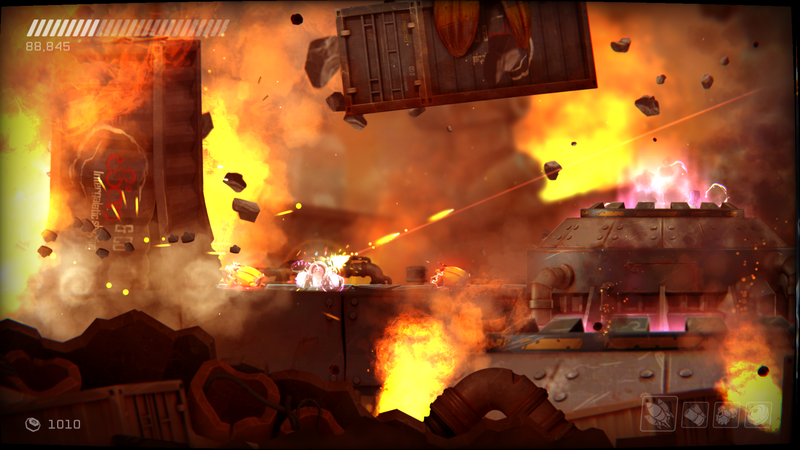 In Rive you play as the space scavenger Roughshot. While exploring Roughshot comes upon an abandoned starship. Abandoned and overrun by robots Roughshot needs to fight off the robots to survive and scavenge the starship for loot. Things don’t go as planned though and Roughshot needs to find a way to escape the doomed starship. Will Roughshot be able to destroy the legions of robots that stand between him and freedom? I have to admit that I didn’t really know what to expect out of Rive before playing the game. Rive is an interesting combination of video game genres. I would say that it is a shoot ’em up (Shmup) mixed with a platformer. That is not a combination you see very often. The one reason I was cautious about Rive is that while platformers are one of my favorite genres, shoot ’em ups are one of my least favorite genres. I don’t hate the genre but it is one of those genres I don’t play very often. Despite having some reservations about the game I have to say that I was pleasantly surprised by Rive. Of the two genres I would say that Rive is more of a shoot ’em up than a platformer. The majority of the gameplay involves shooting the robots that are attacking you. This is done like a typical twin stick shooter. Move with one analog stick and shoot with the other. You also have access to special weapons that you can use whenever you pick up ammo. The shoot ’em up mechanics are pretty typical of the genre. While not as prevalent as the shooting, the game also has a decent amount of platforming. Rive plays like your typical 2d platformer except that there is a lot of shooting between jumps. I wouldn’t say the platforming is particularly difficult but it adds enough variety to keep the game from just being an endless shooter. The main reason that I think Rive succeeds is that the game does a good job merging the two genres into an interesting game. While you don’t have to make a lot of jumps in the game, the platforming comes into play as you try to avoid enemies while shooting at them. This adds something to Rive that I really haven’t seen in a lot of other shmups. Outside of shooting and jumping the other main mechanic in the game is the ability to hack enemy robots to help you in your fight. As you progress in the game you will find hacks which can be used to hack different robots. Eventually you are able to hack a majority of the robots that you encounter. The catch is that you can only hack one at a time and they all have a limited lifespan. While the hacking mechanic isn’t revolutionary I think it is an interesting mechanic that adds another mechanic that you can play with to defeat the enemy swarm. I think what I enjoyed most about Rive is just how seamlessly the game mixes and matches the mechanics added throughout the game. The game teaches you a new mechanic in a lot of the levels and then uses it throughout that level so you get used to it. The game then starts using it alongside other mechanics in future levels. While none of these mechanics are huge on their own, they can create some really fun and interesting scenarios. I loved Rive’s fast pace and how the game streamlines the mechanics into fun and interesting levels. What I think makes the game work so seamlessly is that the controls work really well. Basically there are just a couple buttons that are regularly used. There is a jump button, you use the analog sticks to move and shoot and there is a button to shoot the special guns you acquire throughout the game. The controls are simple and work really well. I don’t think I can attribute any of my deaths in the game to the controls which is what is most important when it comes to controls. While everyone won’t see this as a positive, I liked the game’s difficulty. I would say that Rive is moderately difficult. You won’t breeze through the levels but you won’t be constantly dying either. I like this approach for Rive since one of the main reasons I don’t really like the shmup genre is that the majority of the games in the genre are quite difficult. I have never been great at shmups since I don’t do a great job tracking all of the bullets on screen and thus take way too much damage and die a lot. This isn’t nearly as big of problem in Rive. This doesn’t mean that Rive is an easy game as I did die in the game but the difficulty feels like it is fair rather than frustrating. Now lets get to the game’s length. The game’s story took me around six to seven hours to complete. I would say that is about the right length. I might have wanted the game to be a little longer but the game doesn’t feel short either. Replay value will come from your desire to replay the game. The game includes a time trial mode where you try to complete the levels as quick as possible. There is also the “one token” mode where you see how far you can get on one life. I really didn’t explore either of these features since I don’t care for time trials or seeing how far I can get on one life but if they sound interesting to you they could add some time to the game. So far I have spent a lot of time talking about what I like about Rive. I did have a couple issues with the game though. First I encountered some technical issues while playing the game. The game would occasionally lock up from time to time. It is to be noted that I played a pre-release version of the game which tend to have technical issues from time to time. The game has already had a couple patches since I started playing the game. I also noticed that as the game has gotten closer to the launch date that the technical issues have been occurring less and less. The final version of the game may have all of these issues already resolved or they should be patched out pretty quickly. The other slight issue I had with the game was with the game’s story. Overall I found the story to be pretty average as you are basically just traversing to different areas of the ship. The story isn’t bad but I wouldn’t say that it is a big selling point for the game. The characters are interesting, the voicework is well done, and the game does have its’ funny moments mostly when it is making fun of video games and the video game industry in general. I have to say that I was surprised by Rive. I am usually not a big fan of the shoot ’em up but I had a lot of fun with Rive. I think the developers created an interesting experience combining a shoot ’em up with a platformer. The controls are responsive and the game does a good job combining its’ mechanics to create interesting levels. Outside some slight technical issues that should be resolved soon or already have been and a pretty average story there isn’t a lot to complain about the game. If you think the idea of combining a shoot ’em up with a platformer sounds like an interesting idea, I would recommend picking up Rive. An interesting combination of a platformer and shoot 'em up. Tight controls and fun gameplay. The story is pretty average. Has the occasional technical issue.